RTX is here! Gamers and enthusiasts have been waiting for the long release of Nvidia's Turing architecture but does it bring any significant changes? We are going to look at what Turing has to offer and what's changed from Pascal. RTX 20-series cards are currently available from several AIB (Add-In-Board) partners and directly from NVidia as the Founders edition. One of the major differences to the Founders cards is it moves from its blower style fan design to dual fans with vapor chamber cooling. We are reviewing Zotac's Gaming RTX 2080 Twin Fan which directly resembles the Founders edition with a similar design. Zotac does offer other models with thicker finstacks, more heatpipes, and triple fan design but having a design closer to the reference will help see any differences from a cooling standpoint. Let's dive into what this card has to offer and if RTX offers the improvements gamers need. RTX is referenced as “Real-Time Ray Tracing”. Ray tracing is the future and is a new solution for better lighting, reflections, and shadows. Nvidia Turing is the first GPU to introduce this technology and offers a new level of detail. The issue is that there is very little software support but game support will be coming soon. Battlefield V, Metro Exodus, and Shadow of the Tomb Raider are some of the bigger titles that will be officially supporting the technology. This is also where the popular internet meme RTX on/off comes from. The new cards include huge architecture and software improvements. Nvidia has improved past Pascal by now including GDDR6 with RTX and a new SLI interface called NVLINK. Memory bandwidth has increased from 10 GHz to now being capable of 14.0 Gbps. Turing also includes new Tensor cores, which are part of RTX operations. Cuda (SM's: Streaming Multiprocessors) and floating point operations are improved but previously they were idle in Pascal. Technically, RTX is better but it's way more involved than that. Tensor cores and ray tracing have improved shading up to 78% because previously Pascal used shared memory. Turing improves this design with better GDDR6 memory allocation and cache. GDDR6 offers a less interference when overclocking, better bandwidth, and a better memory subsystem. GDDR6 is going to be the biggest improvement with Turing. GPCs (Graphics Processing Clusters) manage the tensor cores, TPCs (Texture Processing Clusters), and SM's and floating point operations can now run simultaneous calculations. Can the tensor cores provide better results for gaming? The answer turns out, yes. Turing can use DLSS (Deep Learning Super Sampling). This will improve AA (Anti-aliasing) by using deep learning and Nvidia AI. By taking advantage of AI, Nvidia can target specific applications by using conventional anti-aliasing techniques. Nvidia's neural networks are trained using 64x SSAA images, giving the networks a very high quality baseline to work against. The problem is game support, as of now, there are no games to test. This is the same issue with ray tracing. Nvidia does have support for 25 upcoming DLSS titles. See the list here. Pascal 10 series cards previously used a blower style fan design and Nvidia now includes a dual fan design. This offers better cooling capability and helps Nvidia feature its 90 MHz out-of-the-box factory overclock. Both our Zotac model and the Founders card use full-length vapor chamber cooling. This helps spread heat over a larger surface area and transfer the heat to a large aluminum finstack. The dual fans can then push away heat and allow the vapor chamber to refresh its process continuously. Turing cards also include a new automatic overclocking method by adjusting your voltage-frequency curve. NV scanner uses a proprietary algorithm to adjust clock speed and voltage until it finds your cards maximum potential. This is great for newcomers but presents limitations for advanced overclockers. Nvidia has locked down its voltage and also has power limitations set in place for 20-series cards. This can prevent someone from reaching higher than average overclocks. This was demonstrated when Gamers Nexus & other outlets tried to get on the 3DMark Hall Of Fame for Time Spy Extreme. Depending on the model you choose, the price is going to be a huge factor. I couldn't find the exact pricing on this model but the Zotac RTX 2080 AMP is $839.99 on NewEgg. For $140 less you can purchase a Zotac GTX 1080 Ti. The RTX 2080 gives you 1080 Ti performance but is the extra money worth it for the new advancements from RTX? We are going to dissect this idea further in the testing section. The Twin Fan retail packaging offers nothing special but Zotac does offer some unique packaging with their other 20-series models. The retail box allows for animation from using a special box sleeve. You can check that out here. Looking from above we can see Zotac's branding. Their logo is on each fan, Zotac gaming on the right center side, and RTX branding on the right side too. I also like the subtle angular design of the fan shroud. The fans include a new design with direct airflow. The new design can perform a multi-stage sweep with each rotation. Each blade has an inner and outer edge to generate more air inwards. This will effectively help in both the vapor chamber and heatpipe designs. The Twin Fan model includes 2x 90mm fans. The back of the card offers more Zotac branding on the backplate. The backplate offers no cooling advantage but there are small stands to keep it from touching the back of the card. Each screw also helps keep equal mounting pressure for the large aluminum finstack. Turing cards now include some new I/O layouts. Here we have no DVI but get 3x DP (Display Port) ports ([email protected]), 1x HDMI 2.0, and a new USB type C connector for future VR headsets. Looking at the very back of the card, we can see where the connector for RGB/fan power comes from. The first step to taking apart this card is removing the backplate. PRO Tip: When taking apart your GPU, make sure you draw diagrams and layout where your screws go for easier assembly. Once you have all the screws taken out, you can start removing the fan shroud. Underneath, you will see the RGB/fan controller and the dual DC Brushless CF9015H12S fans. They are rated for DC 12V up to 0.40A. Each fan plugs directly into fan headers on the PCB and is then connected to the RGB/fan controller. By removing the large aluminum finstack, we see the copper plate for the vapor chamber cooling. This offers a much larger surface area for cooling the card. Zotac also uses a die-cast metal jacket covering the full PCB. It adds durability and additional heat dissipation to the card. There is a thermal adhesive on top of the jacket to help transfer heat away from the GDDR6 memory to the cold plate. Underneath, there are additional thermal pads covering the VRM and GDDR6 memory. This card offers an 8-pin and 6-pin design. Traditionally, the 10-series cards recommended a 500W PSU but with Turing, its raised to at least 650W. This is a slight increase in power but it's needed with the new technology and increased performance. The VRM is split up like the reference cards. Seeing that this is based on the 2080 reference design, we have what appears to be a 13 phase design, with 10 phases driving the GPU. Steve, over at Gamers Nexus did a complete teardown of the Founders cards. You can check out his coverage here. The GDDR6 VRAM is from Micron, you can find more information here. We can also see the exposed TU104-400A-A1 GPU from Nvidia. Yes, in case you were wondering there is support for RGB through the FireStorm utility. Disclaimer: Before you overclock your system, I can take no responsibility for any damaged hardware that may result from overclocking. There are risks involved with pushing your system further than its intended and also causes more system heat as a result. You will need adequate cooling for overclocking, and decent hardware to achieve anything good. 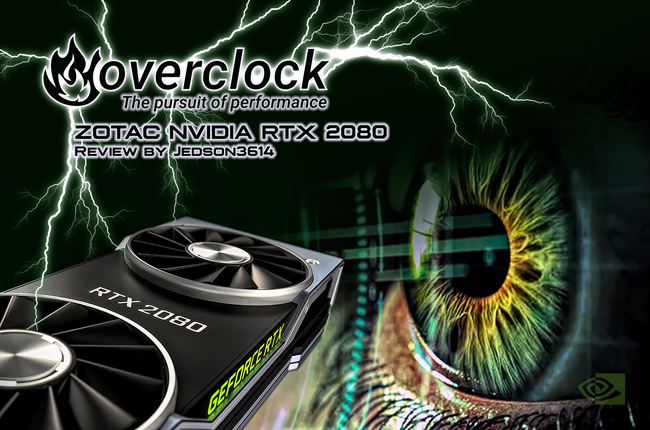 Nvidia RTX cards include a newer feature for auto overclocking. This is what I will use for testing because most people will use this feature out of the box. The new feature is called Nvidia Scanner and most overclocking utilities have the feature built in. I will be using MSI Afterburner for testing and the process is extremely easy. We won't have to cover manually overclocking because the new process comes extremely close to manual tuning and in some circumstances better. If you want to use Zotac's tool, you can find the FireStorm utility here. As of testing, the Nvidia Scanner wasn't setting the Base/Boost speeds but I believe Zotac has corrected the problem. Nvidia Scanner isn't a tool but rather an API. The scanner uses a volt frequency curve based off of deep knowledge from overclocking methodology. While running, it uses arithmetic tests to help tune your cards core clock and voltage. The process aims to eliminate the tedious method of incremental overclocking. To access this tool from AfterBurner you can press ctrl-F or press the tiny icon next to "Core Clock (MHz)". You should try a few tests to tune in your overclock. To get the best results, I would increase your power target to the max. The test will run for about 20 minutes and try and find instability with your Base/Boost limits. When my testing finished, this Zotac card reached 2055MHz on the core. The Scanner doesn't touch the memory so you'll need to tune that separately. This cards memory clock was set to 7000MHz. One of the biggest disadvantages to RTX and this Nvidia Scanner is the reduced power limitations. In order for this API to play nicely for everyone, Nvidia had to set some standards in place. There are other ways around the power limitations but for the everyday gamer, it's not recommended. If you're curious about removing the limitations, look into shunt modding. I want to make it clear that we do NOT have any games currently to test Real-Time Ray Tracing. On a positive note, Windows 10 1809 does include the push of DXR into DX12, It's part of the API and is required for any games that support RTX. It will take time for DLSS and RTX to mature, so in the meantime, I will test some popular games from 2018. I decided to focus my testing on the Zotac RTX 2080 only. There are plenty of other reviews and guides out there that cover the differences between previous generation cards, including Vega. Each game here presented its own set of challenges for testing. I had an issue with bugs, crashes, and black screens. I tested each game at 1440P and 2160P because I felt these resolutions were going to be more common for someone with an RTX series card. The RTX 2080 is right in line where you would see a 1080 Ti perform. This card can offer excellent 4K gaming but at a cost. The RTX 2080 finally brings 4K gaming to the masses. Ideally, to game with reasonable performance at 4K you needed a 1080 or 1080Ti previously. The advancements in the RTX series line of cards includes huge technology improvements but it's yet to be seen how well those will perform in games. I did notice in HDR enabled games that there is a small FPS loss. I'm not entirely sure the exact reasons for this but I know I haven't noticed this in all titles. I'm pretty impressed with the scores from these benchmark tools. I am not breaking any world records but I did happen to beat out previous generation systems by quite a bit. These new cards do push more power but that is understandable considering the new improvements. I tested the Watts consumed by using a KILL A WATT. The KILL A WATT will measure total system power, so this is with all my components in each power state. The temperatures were recorded using MSI AfterBurner and a FLIR ONE PRO. The fan profile and fan curve were set to auto. There may have been a slight power increase but temperatures are improved. This Zotac cooler is based on the reference design with vapor chamber cooling. Nvidia's move from the blower cooler to the dual fans shows better temperatures than previous generations. Even when overclocked, This Zotac dual fan model didn't go over 70°C. The FLIR ONE tool is fantastic because it will allow tech enthusiasts and reviewers to show visual results for thermal testing. It is a next-generation thermal camera that works with iOS and Android devices. If you want to buy one look here. I'm using the new Pro Gen 3 model. For noise testing, I used a high gain microphone. I want to explain a few things about noise testing, and this unit in particular. First: Testing noise levels can be difficult. First, don't expect the same levels even with similar hardware. There are too many differences and variables that go into sound testing. You have to account for background noise and other sounds in the environment. Second: I am one reviewer, and am not a professional sound studio. I am not testing these items in perfect conditions. I do not have an anechoic sound chamber in my test studio. I tested the above using an average background level. I would take my lowest and highest dB reading and take the average of that. There are a few important things to take away from the benchmarks above. I'm on an open test bench and also have other system noises and background noise contributing to those levels. A sound level of 50dB is equivalent to a noise level of a normal conversation. With the load temperatures ranging from 60°C to 70°C, the noise level is really good. The fans spin up just enough to keep the card cool under load conditions. There is more still to be desired by the RTX 2080 and 2080 Ti. The launch of these cards feels rushed and more investigation is needed to take place for Real-Time Ray Tracing. I'm actually fond of this particular Zotac Twin Fan model. It directly resembles the Founders reference design and models the vapor chamber cooling, lower temperatures, and quieter operation. The one thing that Zotac sets apart is a differently designed fan shroud and the addition of RGB functionality. The Nvidia reference cards also have an RGB controller but still limits their logo to green. Perhaps an update can address this in the future. Out of the box, you can expect better performance than previous generations. These cards can handle 4K gaming without any issues but require additional power and have a higher price tag. The Zotac RTX 2080 Twin Fan offers similar performance to the GTX 1080 Ti but only by a small margin. The one thing to consider here is the price, and if it's even worth the upgrade? If you have a 1080 Ti, then probably not. If you are looking to take advantage of RTX and play games that support it, then you will need to upgrade to an RTX equivalent card. For games that will support RTX, you need to install Windows 10 1809 to take advantage of the RTX API with Direct X 12. My biggest surprise came from the Nvidia Scanner overclocking API. I l love to manually overclock but Nvidia Scanner makes overclocking much easier. This tool removes the tedious incremental steps involved and does it much faster. This may be your best bet for overclocking anyway due to the power limitations set in place by Nvidia. My final thoughts are to adopt the technology if you seek the future. When comparing the RTX 2080 to the GTX 1080 Ti, there isn't a huge gain in performance. RTX is going to be the future of gaming but it will take time for game developers to include the technology and for games to adopt DLSS. Once more games become available we will come back and test those against what we have now. If you're interested in buying the Zotac RTX 2080 Twin Fan, look here. I had a tough time finding this online, so a comparable unit is the RTX 2080 AMP for $829.99 (10/15/2018) on NewEgg. Last edited by Jedson3614; 10-22-2018 at 09:30 AM. I see your Superposition benchmark states you're on Windows 1803 (OS Build 17134), so can we assume that you're not on 1809 for the other games/benchmarks and that the stated RTX advantages aren't applied? Does this affect the results? Sorry if it wasn’t clear but I stated you need 1809 for RTX support in games. Since there are NO RTX games, it doesn’t matter. It isn’t going to affect performance. 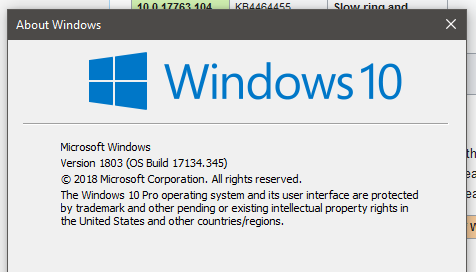 I did use 1803 for testing but am now on 1809. If we were testing a game that needed it, then it would have made a huge difference. That’s why I said, we will update the article once more RTX games become available. I updated the Test Bench section to show 1803. I had 1809 in parentheses to state it would be needed for RTX support. Would be really interesting to see some RTX specific benchmarks or DLSS benchmarks when they come out. DLSS looks really neat, but I really doubt it'll catch on due to it needing to be adjusted/tweaked per game. 70'c for a "reference style" card with that noise level is also very good, guessing your ambient was around 20 or so with that. Glad Nvidia is moving on from the blower cooler finally. Can you run DLSS at native resolution not the DLSS upscaling cheating? I think it may have not been launched in anything yet at native resolution. All the benches are upscales Hence why DLSS offers "better" performance because it's not rendering 4k but I think 1440p only. The native mode supposedly exists, don't remember what it's called but nothing even benchmarks offer it. Cuda (SM's: Streaming Multiprocessors) and floating point operations are improved but previously they were idle in Pascal. Tensor cores and ray tracing have improved shading up to 78% because previously Pascal used shared memory. SM's and floating point operations can now run simultaneous calculations. Can you explain what you mean by the above three snippets, please? I'm assuming "RTX games" = games with ray tracing. I believe Assetto Corsa Competizione has it right now. I may be wrong though. I sent you info from Nvidia data sheets in discord. Was too much to post here for an answer! This is why this forum exists. Scan it and post it if you need to.